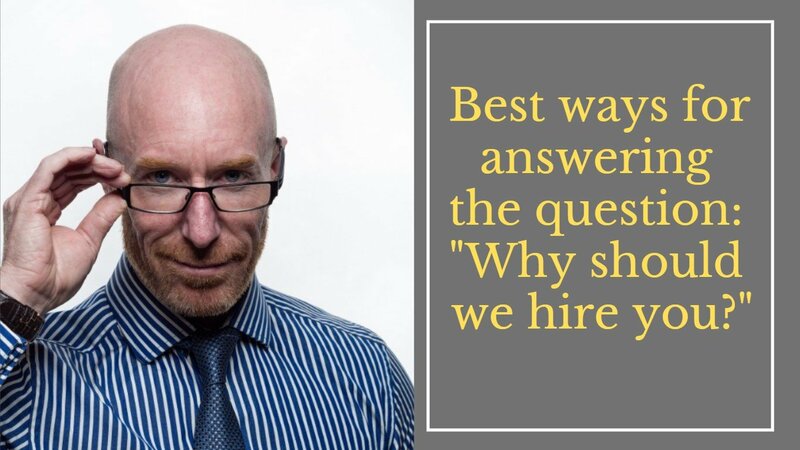 In work interviews, when an interviewer asks the job applicants why they deserve being hired, he simply wants to know why they feel they fit the position. In work interviews, when an interviewer asks the job applicants why they deserve being hired, he simply wants to know why they feel they fit the position. So, the best response must comprise of the applicants’ skills and they must describe how they can benefit the organization. Bear in mind that employers are looking for people who can offer solutions to the existing problems. So, the best applicant for the role is one that can enable them to achieve their goals. Understanding the job details is one most crucial thing during the job hunt process. Read carefully what the employer is looking for. This is what can enable applicants to give an answer that matches what is required; they will be able to prove that they have what’s needed. Make the employer feel that you really have some outstanding personal traits which can make you the perfect addition to his organization. In large organizations, departments and employees differ so much. For instance, those who work in the marketing sector differ from those in the IT department. Ensure that you must have read about the customs of the organization and the characteristics of all its departments. That information will assist an applicant to mention to the recruiter how he/she will fit in the organization. This obviously requires applicants to research thoroughly about the organization and find out what problems it is facing. One must additionally determine what their goals are and how his/her skills will support them. To both the recruiter and to themselves, applicants must be honest. In case they say lies, the truth might eventually come out. Most recruiters tend to ask some questions to see if applicants will provide the same information they wrote on their application. So, if you provide varying information, you might certainly lose an employment opportunity. When jobs are advertised at websites, for example, jobsora.com or others, jobseekers will send their applications. That makes an employer know that they desire to get the job. If applicants get invited for an interview, it means that the recruiter feels they are able to handle the advertised role. Besides mentioning your capabilities, show the recruiter some enthusiasm to make him or her feel that you will have a good attitude towards the job. However, be careful not to go overboard, too much excitement cannot replace professional requirements. One most crucial thing in explaining why you deserve the job is that the reply should be short and clear. When applicants spend so much time responding to this question, they might look like they are not sure of what you are talking about. Just keep it short and clear while ensuring you drive the point home. Whether the job is exactly the same as the one you were doing before, organizations differ. In every new job, there will always be something new to be learned, unique rules to adhere to or different personalities to interact with. Job seekers must also show that they are ready to learn and advance in their field. Of course, most employers are highly interested in what people will bring to their organization. However, if you show that you will also benefit from working there, it proves that you are a very determined individual who is looking for more besides getting a good salary to sustain your life. Explaining why you deserve to be hired depends on you. Just ensure you know your skills and what you have accomplished in your field so far. I am writer on different websites such as thealmostdone.com and techinexpert.com and many other websites.